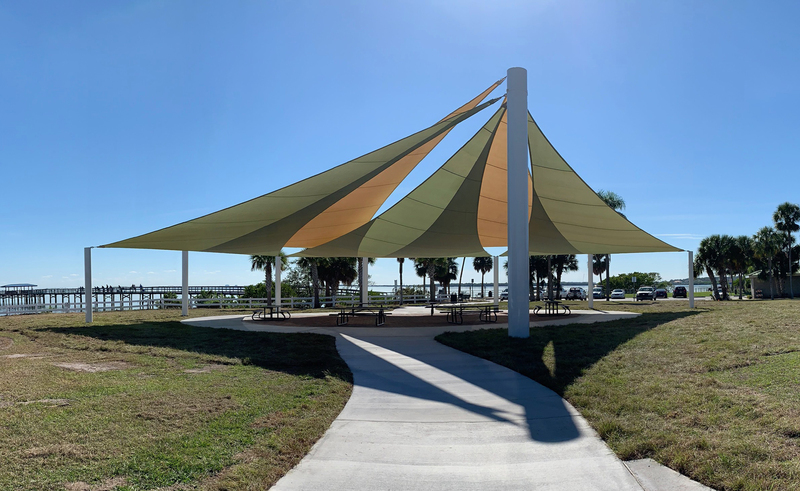 Shade Systems™ is proud to have designed and manufactured a custom ‘Sail’ fabric canopy system for the City of Safety Harbor, Florida at their recently completed Waterfront Park location. The imaginatively layered fabric canopies provide a comfortably shaded seating area adjacent to Old Tampa Bay. The Sail system was incorporated into the site design to accentuate the previously constructed park features, and provide connectivity with the walking paths and boardwalk system that transverses through native wetlands surrounding Waterfront Park. 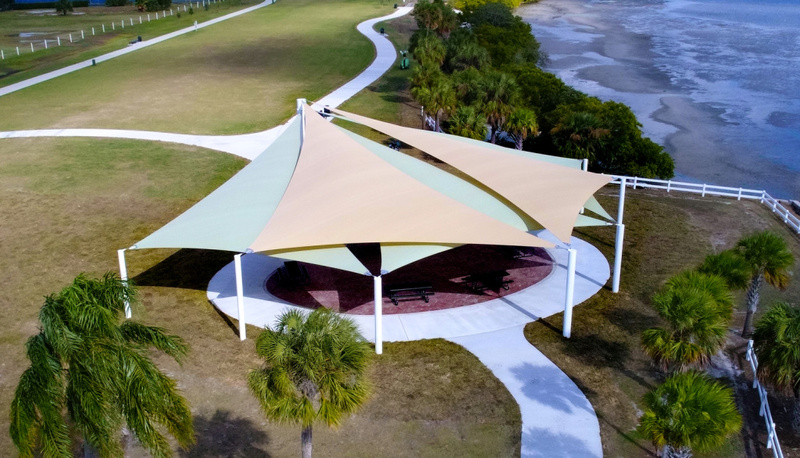 After extensive research to evaluate available shade products on the market, the City of Safety Harbor staff selected Shade Systems as the successful vendor due to its imaginative and colorful ‘Sail’ designs, reputation for quality and service, and overall value delivered. The Shade Systems team was responsible for designing, engineering and manufacturing the desired shade Sail system. When researching shade solutions, more municipal customers choose Shade Systems due to its unrelenting emphasis on product quality. At its world class manufacturing plant located in Ocala, Florida, Shade Systems completes ALL aspects of design and manufacturing, including metal fabrication, welding, fabric sewing, powder coating, and packaging under one roof. This ensures total quality control, as no part of the production process is sent out – it’s ALL done in house! Shade Systems is the premier manufacturer of heavy-duty outdoor shade structures designed to help protect people and property from the harmful effects of the sun's dangerous U.V. (Ultra-Violet) rays. Alan Bayman, President and CEO of Shade Systems, Inc., leads the shade industry with over 30 years of manufacturing experience in the outdoor public use products industry. "The Shade Systems team is focused on providing its market with the highest manufacturing standards and dedication to customer satisfaction in the outdoor shade structure arena," Alan was quoted as saying. For more information, please contact Shade Systems at 1-800-609-6066.